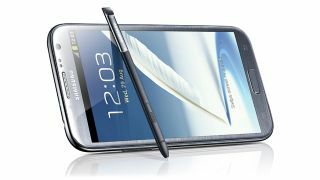 If you are the lucky owner of a brand new Samsung GALAXY Note II then you need to check out our video guide to the best apps to make the most of Samsung's innovative pressure sensitive S Pen. The real beauty of the Samsung GALAXY Note II is the fact that it opens up a whole new world of apps that work even better with the S Pen. Check out the video above for a run through of our current favourite apps on the Google Play store that make the most of the S Pen. If you want to create something really spectacular on your Note II, then an arty app is a good place to start. LayerPaint makes the creative process even easier by allowing you to work with different layers. There are loads of handy tools available to help perfect your masterpiece, including brushes, bucket tool, gradation and hand tool. Once you're happy with your creation, you can even export your work as a Photoshop file to pick up where you left off on your laptop or desktop computer. An app that's essential for any keen photographers out there is Touch ReTouch. Using your S Pen, you can tweak and edit your GALAXY Note II photos in great detail quickly and easily. You can remove shadows, ghosts and flare, touch-up facial tone and even remove whole bridges and buildings from a background. Then if you're unsure of the changes, there's an unlimited undo/redo feature and you always keep the original image resolution. Maze Racer is hand drawn and looks beautiful. It was originally created for a 'Best S Pen app' competition, so is perfect for the S Pen. The aim is to draw a line from the word 'start' to the word 'finish', with lots of obstacles getting in your way. You're even encouraged to draw your own levels and send them in – which is made infinitely better using the S Pen. Angry Birds isn't an S Pen specific app, granted, but we reckon it's even better to play with one. The precision of the S Pen is loads better than clumsy fingers and you can swipe your catapult across much faster too. This time the eponymous Angry Birds and the enemy insolent swines find themselves floating in a strange new galaxy. But of course the game's built on the same principles as before – launch your birds to destroy as many pigs as possible. This version has 140 levels to complete too, so should keep you busy.